“To see children have to go through this is heartbreaking and sometimes the only thing I can do is try to bring a smile to their face by playing and interacting with them, giving them fun things to do while they are in the hospital,” said Dustin Banks, a member of Ungerboeck’s Community Service Committee. Ungerboeck’s Community Service Committee tries to plan quarterly projects/donations for a variety of causes throughout the year. Ungerboeck has been participating in community service projects/donations for as long as Dustin can remember. However, in 2012 they formed a service committee to coordinate company-wide activities year round. Ungerboeck has been involved with many service projects over the years. These include electronics recycling, blood drives, food drives, and Adopt-a-Family for the St. Charles Crisis Nursery. It was another member of the committee who suggested helping Friends of Kids with Cancer. Holly Marchlewski had worked with Friends of Kids with Cancer years ago when her Girl Scout troop made Easter baskets and held a media drive. “They are a great organization and who doesn’t want to help sick kids?” said Holly. Other members of the committee were quick to get on board with helping out Friends of Kids with Cancer after Holly’s suggestion. Member Carrie Spalding personally knows the struggle families with sick children go through. “For me, personally, I just enjoy helping and giving, and as the aunt of a terminally ill child, helping sick children in any way is enjoyable. I know the pain and struggle these families go through, and that sometimes the smallest things can produce the greatest joy and hope,” said Carrie. 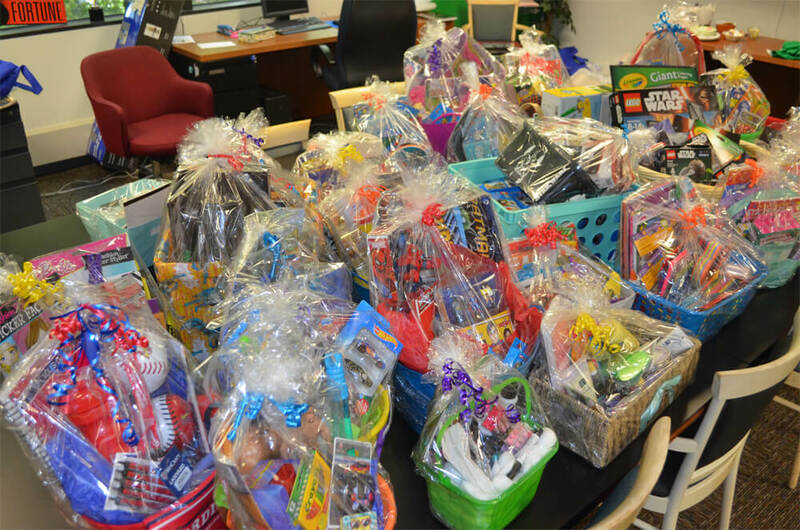 These efforts to produce baskets for Friends were coordinated by community service members Holly Marchlewski, Carrie Spalding, Caty Pomeroy, Jack Wagner, Katie Eisenbath, Kimberly Black, Linda Roth, and Dustin Banks. Friends of Kids with Cancer thanks you for your efforts! Donations like these help kids with cancer…be kids!